After saving two lives in a brave rescue, Rodger L. Parker went to the nation's capital this past September with a humble heart. 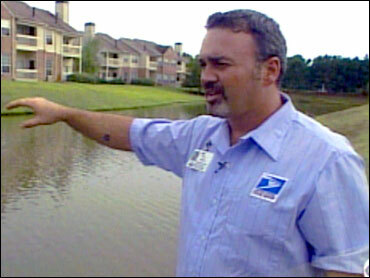 "To walk down the same steps as Lincoln, Jefferson and George Washington, to be in the same city ... it was an honor to be there," Parker says of his time being honored as The National Association of Letter Carriers' 2003 National Hero of the Year at a ceremony in Washington D.C.
On most days, Parker walks down the steps and sidewalks of Germantown, Tenn., where he makes his living as a mailman. "I love my job and I couldn't picture myself working in any other kind of career," he says. He doesn't hesitate to tell of his twelve years in the Navy, but he is a little more reclusive about his Navy boxing career. He had 28 wins and no losses. Parker is also modest about his heroic life saving deed. The two lives Parker saved belong to Robert and Betty Byington. "[Robert] is a dialysis patient," Betty says. "Every day is most precious and requires a lot of caretaking, and that is what I do -- around the clock." On their way home from the hospital late one afternoon, they were approaching a stoplight when their brakes failed. "And I said 'Good Lord, we can't hit those cars.' What a mess, we'd kill people," Robert says. "So we went up on the sidewalk and I remember little pines being there." Parker saw the couple in his rearview mirror. "[Robert] drove down in the water," Parker recalls. "And when he hit the water, they kind of skidded through the water and went towards the other side and went in the middle out there." The Byington's truck was sinking fast. Parker left his car in traffic, bolted down the bank and dove into the water. "I rolled down my window and there was Mr. Parker, just in that instant," Betty says. Parker pulled Betty out through the window and put her on his back. Two other rescuers struggled to help Robert Byington, but time was running out. "I figured this is all she wrote," Robert says. "I said, 'Lord, here I am, is this it?'" Parker's Navy days of water rescue prepared him well for the event. "I didn't understand why we couldn't get him out," Parker says. "But I knew one thing. He was not going down -- not on my ship." But the sinking truck's powerful undertow was pulling Parker under. "I just grabbed him and kind of jerked him three or four times until I could get him out of the vehicle before it completely submerged underwater," Parker remembers. With Robert and Betty safely on shore, Parker left for home without giving anyone his name. The postmaster assembled his letter carriers the next day trying to find the anonymous rescuer; only then did Parker humbly step forward. The Byington's lives took yet another cruel turn after their ordeal. Robert had to have both legs amputated due to complications from diabetes. And Betty's life got so busy she never had the chance to say thank you to her hero, until recently. "God is all great, greater than any of us. But the greatest angels on earth are the heroes," she says. "And, Mr. Parker is a hero."